Blue whale and big boats traveling along the same routes can become dangerous situation for the majestic blue whales, our vessels -the massive damage often incurred and people aboard. Blue whale and boat collisions can cause disastrous consequences including the obvious physical harm to the largest mammal on the planet but also severely damaging ships large and small, sometimes irreparably so. Marine Biologists, the Coast Guard, Navy, National Marine Fisheries Service and various coastal authorities all have an invested interested in preventing these occurrences and are continuously studying and monitoring vessel “traffic” along shipping lanes and the migration and behavioral patterns of blue whales, but more specifically how they overlap. Along the California coastline, residents are quite used to and eagerly anticipate the annual migration of the California Grey whale. In fact, whale watching tours and a variety of ocean activities are integral parts of the California lifestyle. Besides the gentle and curious grey whales, dolphins, sea lions and hundreds of bird species are also common sights offshore, yet spotting a blue whale is always considered a special treat! Collisions are rare for passanger yachts however collisions with commercial container ships are not uncommon. This may just mean that blue whale population numbers are on the rise, or perhaps they are moving their routes to more shallow waters? Both are valid questions to be answered by scientific study and now we may have some clearer answers. On July 23rd a new scientific study was concluded and published which analyzed data from the first ever comprehensive study on blue whales. Their analysis and findings concluded that the shipping lanes, specifically along the Southern California coastline greatly need to be altered or adjusted. The report released on PLOS one entitled “Spatial and Temporal Occurrence of Blue Whales off the U.S. West Coast, with Implications for Management” utilized the data from a set of 171 tagged blue whales off the California coastline where they found a wealth of data demonstrating the increased risks of blue whale and big boat collisions. Between the months of July to October scientists determined that the highest concentrations of Blue whales were “close to large human population centers and busy port terminals,” of the heaviest used being the Channel Islands and Gulf of the Farallones. Making the problem even more complex in southern California waters are the presence and necessity of Naval ships- not just commercial vessels and barges. This study also noted that in Southern California the population densities are all “moderate to high density”, making a clear path even more murky. 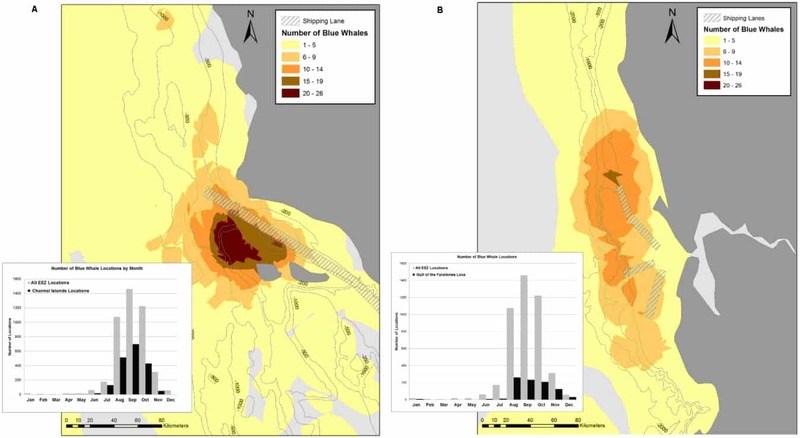 One suggestion posed by the authors of the journal proposes a seasonal change of the shipping lane southward away from the highest density of blue whales around the western portion of the Santa Barbara Channel on a seasonal basis. The journal also mentioned a similar successful shipping lane changes off the coast of eastern Canada which lowered the deadly ship collisions with the endangered Right whales by as much as 80%, now that’s a positive impact! The Maritime Executive reported that these updated charts were made immediately available by OceanGrafix, who provides print on demand nautical charts, the first and only company to provide such a service. The changes made in 2013 applied to the areas of Long Beach north to San Francisco (including Cordell Bank, Gulf of the Farallones and Monterey Bay) and main commercial fishing territories. In 2012 a comprehensive international impact report was released relating to this very same issue of blue whale deaths caused by ship strikes around Sri Lanka, where in late March and in early April two blue whales were killed in ship collisions. Since Sri Lankan waters have a year round presence of blue whales and key behaviors are often witnessed in those shipping lanes (courtship and feeding) there must be changes and further studies on the negative impacts of this overlap, not just seasonally, or even locally in U.S. waters. In Southern California the Pacific Ocean is a busy place for mammals and machines alike. From year round beachgoers to sailors, pleasure craft and Naval ships, dolphins, whales, sea lions and sharks, sea do’s and paddle boards, kayaks and speed boats, we all must peacefully share the ocean, (it is called the Pacific for a reason). Knowledge is power, and now that there is strong scientific data collected from over 15 years of tracking to show that some changes should be made to our shipping lanes (even if just seasonally).It’s clear who should have the right of way, our world’s largest creature-the majestic blue whale. 1.) They are currently listed on the endangered species list with the number one cause of mortality being “ship strikes”. According to the National Marine Fisheries Service recorded and average of 0.2 ship collisions with blue whales every year between 1998-2002. 2.) The heart of a blue whale is the equivalent in size to a Volkswagen Beetle. 3.) The world’s largest species eats 4 tons per day of krill, one of our planets smallest nutrient rich organisms. 4.) Besides their large size, they are also the loudest species on planet Earth emitting calls at 188 decibels (a jet engine by comparison is around 140 decibels) and the sound can carry for hundreds of miles.